Bawangaja temple is one of the most famous Jain pilgrimage sites in Madhya Pradesh. Located in the district of Barwani, this temple is world famous for the statue of the first Tirthankara, Lord Adinatha, which is carved out of the side of the mountains which are in the Satpura range of mountains in the central part of the Indian subcontinent. The statue, which is carved out of one single rock, is impressive in its dimensions, location, and its sculpture. 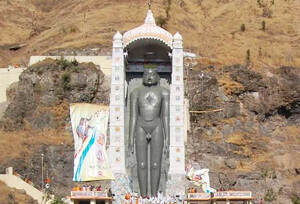 It stands 84 feet tall and is carved right in the middle of the Satpura mountain range at a height of 1300 feet, which is at the base of the mountain. This is similar in planning to that of the other famous Jain temples in India, such as Lord Bahubali’s statue at Shravanabelagola. The statue pf Adinatha is renowned for being the world’s tallest known statue of the first Thirthankara in Jainism. It was sculpted in the early part of the 12th century and still retains its glory and magnificence. This idol also holds the record for being the highest (location wise) in the world. At the top of the mountain is the temple called Chulgiri, also known as Siddha Bhoomi. This is a holy place because it is where three renowned Jain scholars as well as countless others meditated on the Divine and attained self realization. The statue of Adinatha is depicted as sitting in the Khadgasana posture. The hands are not joined with the legs. The statue is unique in that it is perfectly proportionate and the emotions on the face of the idol have been etched out beautifully to denote a serene expression that is a mixture of compassion and joy. The left side of the idol has a statue of the Gomukha Yaksha and the right side has the statue of the Yakshi Chakreshwary.